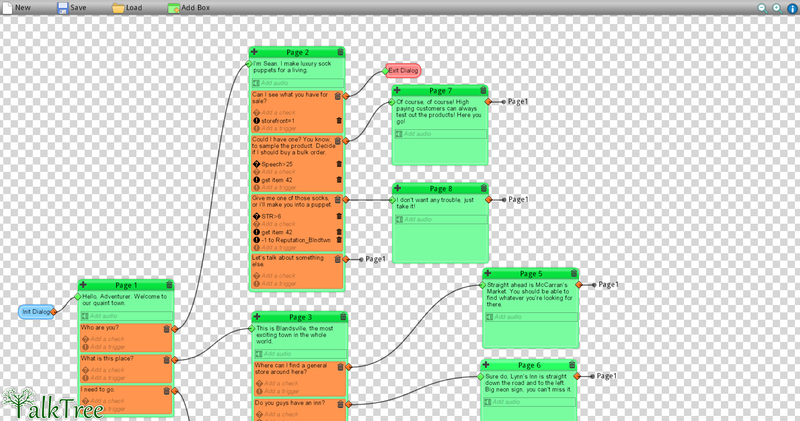 Ever wanted to implement dialog trees in your game, like Fallout: New Vegas, Mass Effect, and ShadowRun? Well, now you can! TalkTree allows you to create complex dialog trees for story- driven games, RPGs, and more. 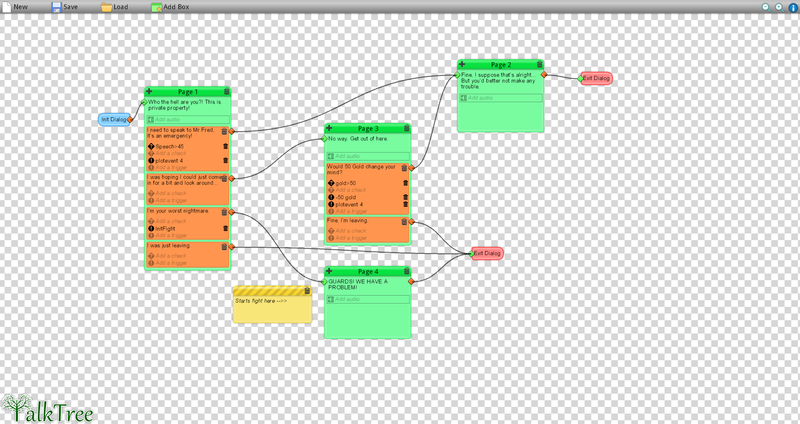 Using a simple, easy to understand flowchart- style design, the editor allows you to make every conversation in your game work detailed and fucntional. Immerse your player in a realistic environment with believable, dynamic characters. Use skill checks and event triggers to blend player stats and speech! 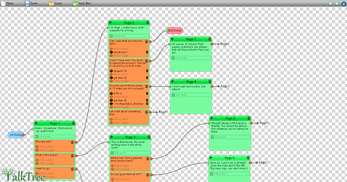 TalkTree works as a standalone program which saves dialog trees in .INI files for use with Game Maker Studio! Variable triggers: modify variables based on which answer the player chooses! Compatibility with your own dialog system: The saved file simply stores information about the dialog tree, how you read it and display it on screen is fully customizable! Single file saving - You can store hundreds of conversations in a single dialog.INI file! I am also curious if this is still supported or not. Is this still supported? I'm very interested, but I don't want to buy a dead program. I think I must've gotten this on a giveaway or something, since I can open it. Editor crashes when I try to delete a page, no manual or demo. Help? Currently this isn't possible by default with TalkTree, but if you check the manual you can see how text data is stored and probably code your own system to do so. 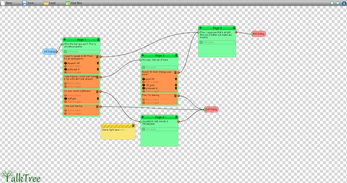 Re-doing the export system to create a text file probably wouldn't be worth the time investment, unfortunately. 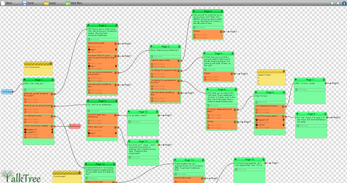 And yes, it is possible since you have access to all of the dialog data-- just might take a while to program. I don't have enough money to buy this, but it's probably great! Keep up the good work. thank you for helping, I sent you an email let me know if you didn't get it. I am really interested in using this to make my game, however I just purchased game maker studio 2 and was wondering if this is compatible? If so, am I going to need to use a work around or would I be able to just use it the same way I would if I was using gm 1.4? Although the demo file isn't updated for GMS2, the rest will all work fine! Although I'll probably need that demo because I'm a complete noob haha. I'll figure something out. Thanks for the speedy reply. you can import the demo just like any studio 1 project! This program is great and very easy to use. However, is there a way to use this with something other than Game Maker. I would like to use this to create dialog trees that I can incorporate into my own game/engine I'm writing, but I have no way of loading these files because I don't know what format the ini file is in. Any help would be appreciated!! Thanks!! I believe that the manual goes into some detail on this: the ini files store the information in DS Grids converted into strings. The only way I know how to deencrypt these ds grids is with Game Maker Studio. Hey, me again - but this time with a brief review. I've been eyeing this product for literal months. As a poor fellow trying to break in as indie dev, $10 is something I can afford but have to weigh whether or not it's worth it. I bought this product this morning after a brief conversation with you, and got to work tinkering around with it. First off, the editor is amazing. If anyone has used the dialogue editor found in Fallout 4 or Skyrim - this is a lot similar. Just as powerful as those, and somewhat easier to use. When it comes to importing the dialogue into Game Maker Studio, it's as easy as could be. The code in the example project is well commented and is flexible and easy enough to understand to adapt it into any format you'd want. If you are new to GMS you may have some trouble, but if you understand the basics of Game Maker Language, you'll have zero issues. Then there was the BIG draw to this project for me - checks and triggers. I wasn't sure what I was expecting, but this is at least 10x more. It is open enough where again, if you know what you're doing - you can have these checks and triggers do ANYTHING. Literally. If I wanted to, I could even implement code that would have a trigger make the game change resolution. How cool is that? So what I'm getting at is this: If you're a developer and don't want to create your own branching dialogue system from scratch (and why would you when this is available?) then you can't go wrong with TalkTree. At ten dollars, it is a steal. winterdrake could charge 30 or even 50 dollars for this and it would be worth it. And as far as winterdrake is concerned: you would be hard pressed to find a creator of a product as friendly and quick to respond as this one. Hey there! Would we be allowed to sell games made using TalkTree? I'm probably going to release my game for free, but if I would decide to sell it I'd like to know your input on the matter. Of course you can sell your game! 😊 Just let me know when your game is out, I love to see what people have created with TalkTree! Good to know, thank you! And will do! Another quick question - may we use and modify the code from your example project? Like use some as is and then use others slightly modified? Hey! I was wondering -- the manual mentions an option to assign an audio file to a given piece of text. Is there a way to assign a sprite/sprite index as well, for the purposes of changing a character's expression? ...that makes sense, yes. :P thank you! Hi there, does TalkTree currently support GMS2? Good point, I'll try that! Thanks. I've had no problems with it. And it's great. It does. 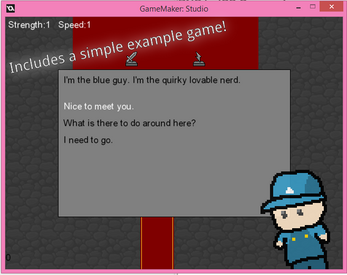 I've been running the example project in GMS2 and imported my own dialogue trees without any problems. The question is.. does this program support Korean by fixing the program? so what I want to know is.. if I add font that supports Korean, does it work well? For this program I've used Game Maker's default text features which I don't believe support any sort of foreign languages. If your messages don't display well in the demo, they probably wouldn't work in the full version. Sorry!! If you delete a page that still has something linked to its input node, the program crashes, with the error being "FATAL ERROR in action number 1 of Draw Event for object o_node_orange: Unable to find any instance for object index '100040' name '<undefined>' at gml_Object_o_node_orange_Draw_0"
Oh my, nobody's mentioned these to me before! I will look into them ASAP. Everything should be fixed, I just uploaded a new version of the program. So sorry you had to deal with all those bugs! That was an excellent response time! The issues do seem to be completely gone now. Thank you very much! I just bought this program yesterday and I just tried using it today. 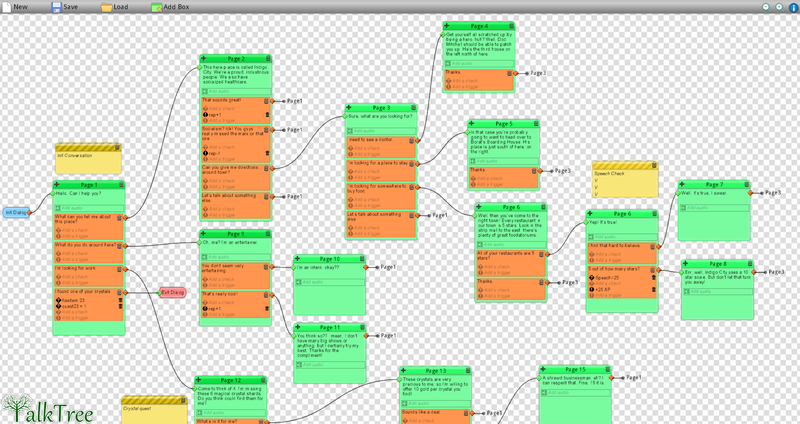 I made a dialogue tree that had a total of 9 pages and about 14 options total. I imagine this is not a lot of memory since one page can have a max of 25 options. When I was adding the final page, a message appeared that said "warning: no memory" or something along those lines and crashed the whole program. I never got a chance to save and I could probably easily redo it in about 10 minutes, but I was wondering if things like this happen often, because if they do then working on bigger projects will be a pain. btw, I checked the storage space on my computer and there is still 762/904 GB(gigabytes) free. Ya sure, I can't believe you responded within 5 hours of my complaint, thanks. Thanks for all the help, you really went above and beyond to help me with a problem that was my fault. You always responded very quickly and with very helpful advice, thank you again so much. This is cool :) before I download it, will this work for games made using RPG maker? For example: RPG Maker MV, and VX Ace? 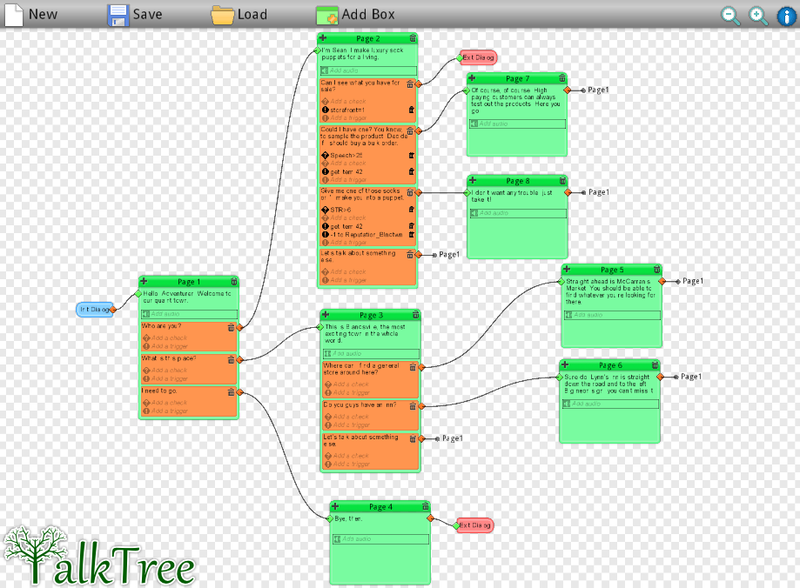 TalkTree is built to export dialog trees as data grids stored in INI files. As far as I know, RPG Maker is too limited to read these. It's not necessarily that RPG Maker doesn't read INI files, but the ds_maps it writes are only easily decoded by Game Maker (and as far as I know there isn't much out there on the Internet on decoding them yourself). TalkTree is a new program built from the ground up with new functionality and professional quality. 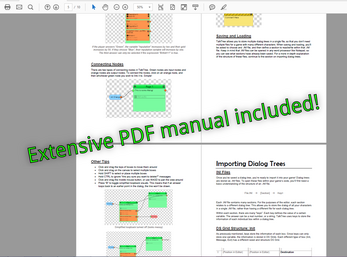 This program is not associated with the original 2014 Dialog Tree Editor, so you'll have to purchase it separately. hi, I think it is an incredible solution, was watching the demo and are not completely understood how is structured data, you think I can see the PDF beforebuy?, to see if it fits what I need. thank you. Sure thing! 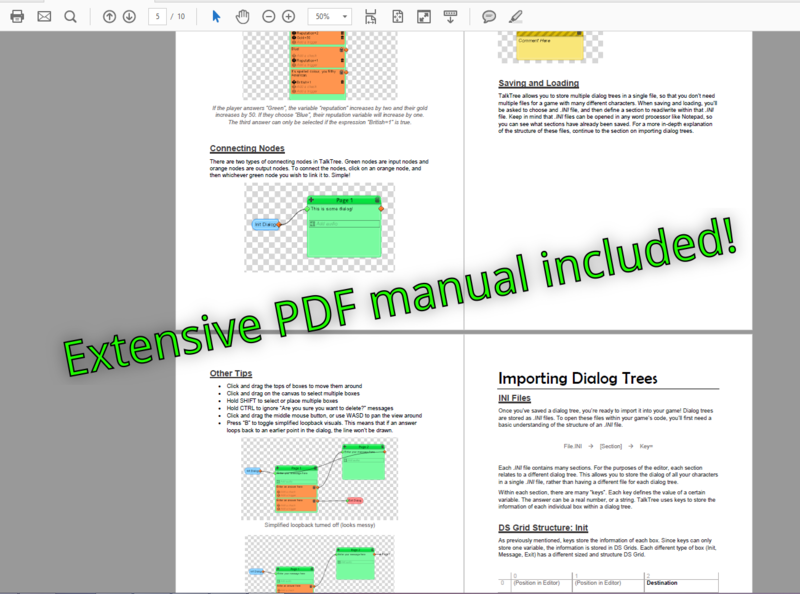 I've added the manual as a free downloadable demo file. hi! i can't manage to save files at all with this program, even when i run it as admin. I havent heard any other reports of this, J. Could you email adventuredungeondevs@gmail.com so we can investigate? definitely! thanks for the prompt reply. i'd really love to use this program.